The latest update of the software slicer for 3D printing on MakerBot’s products – MakerBot Desktop 3.7 adds some interesting new features that might be what more advanced users were waiting for quite a while. 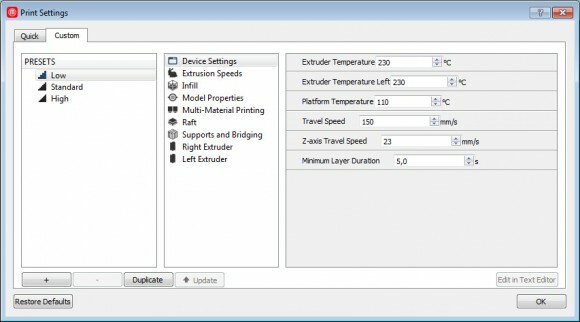 The new version comes with Custom Profiles for the 3D printer where you not only have the Quick Print Settings page like before with only the most basic options such as Quality, Layer height, Infill percentage, Number of shells and Raft and Supports along with temperature for the extruder. It seems however that the extrusion speed and travel speed are no longer available in the Quick tab, but are only accessible via the Custom profile tab, so that could be a bit of inconvenience when working with some more exotic materials and do not need other more advanced options besides the speed. Now there is a new tab called Custom where you can create custom presets with much more detailed and advanced options available such as the ability to set separate speeds for different aspects for the printing process, or different types of infill pattern aside from the standard hexagonal one you have multiple other options, or to print with higher quality the outer shell of a model and use thicker layer height for the infill for example. There is also much more user control available for the way that Rafts and Supports are being printed, should you wish to play with these settings and so on. The only thing missing however is a detailed descriptions of all of the new options available to the user to play and experiment with. 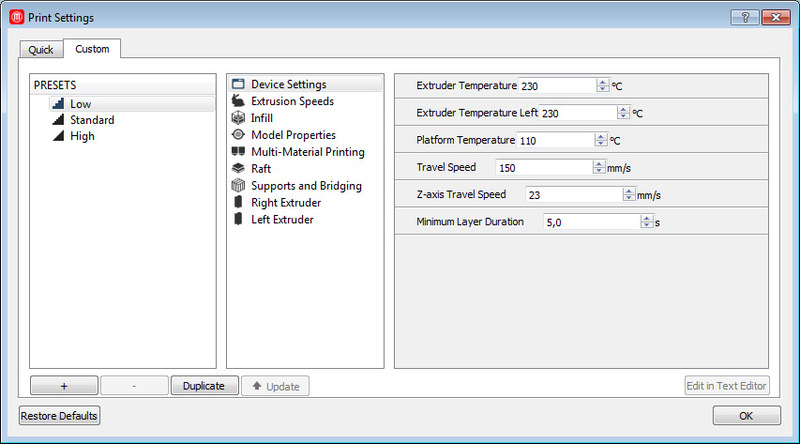 Looking at the various settings it seems that with MakerBot Desktop 3.7 you might get some more additional features accessible that are not even present in the Simplify3D software. The Simplify3D commercial slicer package that is loved by many advanced 3D printer users thanks to the wide support for different devices and a the many advanced features available to the user to play with.